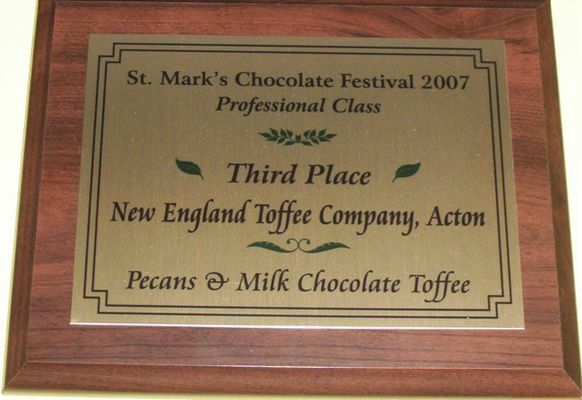 In February, 2007 our Pecans & Milk Chocolate Toffee was the 3rd place winner at the 17th annual Chocolate Festival in Westford, MA. We are very proud our our 3rd place award, as we competed against many chocolate desserts from well-known area restaurants. This year the first place winner was Chocolate Orange Pots de Creme by Chef Richmond Edes of Gibbet Hill Grill in Groton, and the second place winner was Nuts about S’mores from Colonial Inn in Concord. The Chocolate Festival raised about $3,000 for Massachusetts food banks in Westford and Lowell.